HOUSTON, Nov. 6, 2018 /PRNewswire/ -- CUI Global, Inc. (NASDAQ: CUI) announced today that its wholly-owned United Kingdom ("U.K.") energy division, Orbital Gas Systems ("Orbital"), has entered into a technical collaboration with Mitsubishi Electric Europe BV ("Mitsubishi Electric") to further enhance Orbital's remote telemetry unit (RTU) and BioMethane product lines with Mitsubishi Electric's leading-edge automation control platforms. The partnership will ensure Orbital continues to utilize optimum industry standard equipment for its product lines. Mitsubishi Electric, a global leader in automation products, will provide the hardware product platform and technical support, with Orbital contributing system design and implementation expertise. Customers will benefit from the continuity of Mitsubishi Electric product support, diversity of implementation knowledge and speedy turnaround of hardware supply. Both companies will partner in the marketing and sales of the product lines. The services will initially benefit U.K. gas transmission and gas distribution networks with further collaboration expected throughout Europe and North America. For more than 35 years, the Mitsubishi Electric team has been growing and expanding its network and services throughout the U.K. Today, Mitsubishi Electric's professional team works closely with its customers to meet and understand the challenges or desired outcomes with the focus on bringing solutions to those opportunities using the wide range of world class Mitsubishi Electric products. 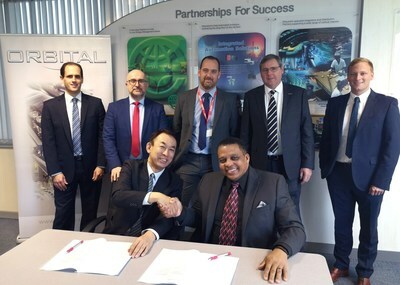 Roger Payne, divisional director, Automation System Division, Mitsubishi Electric, said, "We look forward to working together with Orbital to meet the challenging requirements of a market embarking upon the process of digitalisation, which will improve efficiency, lower maintenance burdens and increase availability throughout the U.K.'s national infrastructure. By combining Mitsubishi Electric's leading-edge automation control platforms, including the recently launched iQ-R and iQ-F range of products, with Orbital's expertise in gas transmission and distribution applications, we will be able to deliver a flexible, reliable and cost-effective equipment-based solution to market." Paul D. White, president, Orbital, said, "It's an absolute honor to collaborate with Mitsubishi Electric. They are our newest partner and a wonderfully established organization. Our partnership enables both companies to pool complimentary knowledge, expertise and technologies to create better solutions for our customers on a befittingly stable platform. There is significant benefit in the product compatibility of the Mitsubishi Electric platform, meaning we can continue using our proprietary developed software as the hardware product develops. Furthermore, Mitsubishi Electric's recently launched iQ-R and iQ-F Programmable Logic Controllers are the fastest in the market. We are looking forward to incorporating these valuable products into our other technical offerings, further strengthening our collaborative partnership as we move forward." Commenting on the partnership with Mitsubishi Electric, CUI Global president & CEO William Clough, stated, "This collaboration allows Orbital to continue to build on its efforts in the RTU market, first started with its proprietary IRIS software. Now, with input from our major customers and Mitsubishi Electric, our RTU units will address the specific needs and requirements of our customer base. In this way, we believe we can be even more responsive to the industry and much more likely to increase our market share in this burgeoning field."